The Polymat indoor/outdoor carpet mats and runners have a 3-year surface wear guarantee. They are made from high-density polypropylene cut-pile yarn that is permanently fused to a vinyl base. It stops tracked-in dirt at the door, reducing maintenance costs. 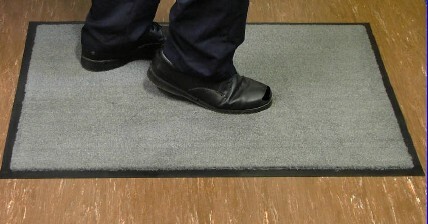 Flammability rating: Polymat mats and runners meet U.S. DOC Flammability Regulations FF1-70 and FF2-70. Wide selection of sizes and colors as shown, all with vinyl edges. For prices and shipping charges on runners, contact U.S. Bank Supply, or if you desire a custom size. Phone: 805-218-6106 , or e-mail at orders@usbanksupply.com. The Polymat indoor/outdoor carpet mats and runners have a 3-year surface wear guarantee. They are made from high-density polypropylene cut-pile yarn that is permanently fused to a vinyl base.